​Over the past seven years, we are proud to say we have protected hundreds of thousands of Chromebooks from unneeded screen breaks, saving districts thousands of dollars per year. We thank everyone for the phenomenal feedback we continue to receive and we look forward to continuing to protect your investment. 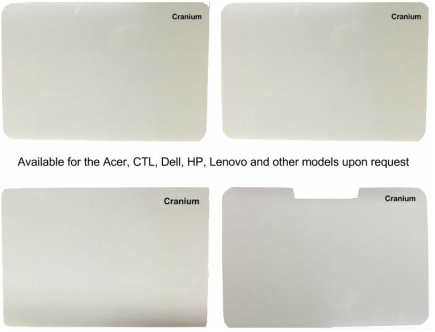 Taking all the best elements of the original Cranium Chromebook Protector, we incorporated those into a stronger, lighter and even more durable cover for the Chromebook, Acer, CTL, Dell, HP and Lenovo models. The Cranium Chromebook Protector is the only cover, that we know of, on the market that incorporates a double-sided aluminum outer and a thin softer PVC core. When sitting by itself, the Cranium is incredibly rigid. When attached to the Chromebook, the screen is virtually impossible to flex, and it looks great too. Districts who are using the Cranium have seen an 85%-93% decrease in breakage rates. Your inexpensive Chromebook turns into a nice looking laptop. Please check out the YouTube video [link] for more detail and to see the Cranium at work. For additional information or for a formal price quote, for any Chromebook model, including the Acer, CTL, Dell, HP and Lenovo. Other models may be available upon request, including 11" and 14" Chromebooks. Please click the contact button below to send us an email. "There has been a significant reduction of cracked screens"
​"...knowing we had to have a solution that would offer lots of protection but fit in a backpack -- and the Cranium is the only solution for that. Sleeves only offer superficial protection -- from scratches and dirt."